A shower ofshooting stars has been recorded by instruments on Mars for the first time,astronomers say. Meteorshave been spottedbefore by the Mars rovers, but no device has ever detected a full showeruntil now. United Kingdom astronomerspredicted the event by tracking a comet's path near Mars, then comparing theirforecast with Mars Global Surveyor (MGS) satellite data of the red planet's ionosphere? the upper reaches of atmosphere teeming with charged particles. "Justas we can predict meteor outbursts at Earth, such as theLeonids [shower that occurs every November], we can also predict whenmeteor showers are going to occur at Mars and Venus," said ApostolosChristou, an astronomer at the U.K.'s ArmaghObservatory who helped predict the martian meteoric event. Christou isset to present findings about the meteor-showering pass of comet 79P/duToit-Hartley at the Royal Astronomical Society's National Astronomy Meeting in Belfast on April 2. Just as onEarth, meteor showers on Mars can occur when a planet passes through the dustytrail of a comet. There areno conventional photos of the meteors in the new findings, but studying thebrightness and length of meteor streaks in optical and radio data, Christou said,can help determine the age, size and composition of a comet'score. Scientiststhink four times as many comets dust Mars with their tails compared to our homeplanet, as a high proportion of comets hang out near Jupiter ? the red planet'snext-closest neighbor. So there could be many more meteor showers visible fromMars than from Earth. Some evenblame such frequent comet dusting of Mars for the puzzling coursechange of Mariner 4, the first spacecraft to visit Mars, in the 1960s. Christou saiddetecting the distant meteor shower wasn't easy. "Webelieve that shooting stars should appear at Venus and Mars with a similarbrightness to those we see at Earth," he said. "However, as we arenot in a position to watch them in the martian sky directly, we have to siftthrough satellite data to look for evidence of particles burning up in theupper atmosphere." Christouand his colleagues predicted six meteor showers caused by the intersection ofMars with dust trails from comet 79P/du Toit-Hartley since 1997, which was whentheMGS satellite entered orbit. 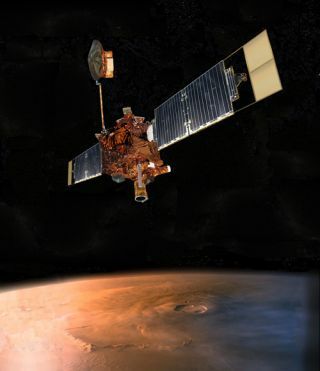 The teampinpointed meteor streaks indirectly by measuring disturbances in electrical densityof Mars' atmosphere with the spacecraft's radio communication system. Out of the twoshowers MGS could have recorded ? in 2003 or 2005 ? Christou and his colleaguesfound hints of a shower only in data of the 2003 event. "Wedon't see anything in the 2005 data because the meteors burned up deeper in theatmosphere," he said, adding that the depth would cover up an electricalsignature. "If we are going to get a clear picture of what is going on, weneed more optical and ionospheric observations of meteor showers at both theEarth and Mars so we can establish a definitive link between cause and effect."